A zoo animal took a flying leap at a spectator only to be repulsed by a sheet of glass. Sound familiar? Last week, it was a lion pouncing at a child standing against the glass at Japan's Chiba Zoological Park. This time, it was a white tiger and a grown-up. The clip, posted to YouTube last week, screams photo-op - at the expense of the frustrated tiger. 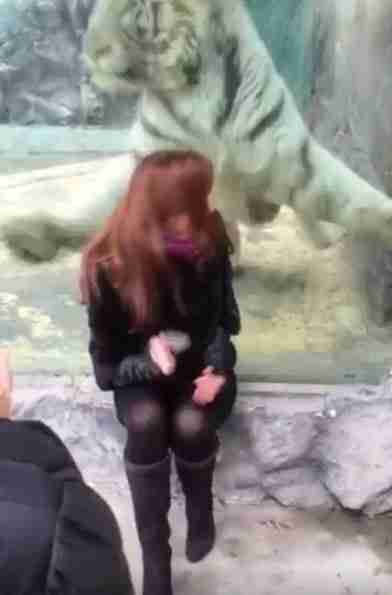 In the video, a woman is seen sitting at the edge of the enclosure, her back turned to the glass while a tiger slowly creeps closer. Giggles can be heard in the background, as the baited animal edges ever closer. And when the woman turns to face the animal, he pounces - only, of course, to be rebuffed by reinforced glass. The woman runs away screaming amid a cascade of laughter. As Adam M. Roberts, CEO of Born Free USA, told The Dodo last week, it's only natural for big cats to see humans as prey. What isn't natural for these cats, of course, is being repelled by a seemingly invisible glass wall. In fact, there's nothing natural about a big cat in captivity. Having humans treating them like thrill rides at an amusement park can only deepen an animal's despair. Yet we see it happen again and again. Please, don't bait the tigers. Captivity isn't the only thing unnatural about this big cat. To read about the truth behind white tigers, click here.